The tour of WONDERLAND the musical due to take place at Wolverhampton Grand Theatre next week has been cancelled with immediate effect. Some performances scheduled at Swansea this week did not take place and the remaining tour dates of the Frank Wildhorn musical at theatres in Richmond and Bournemouth have also been cancelled. Sales for the production in Wolverhampton had been strong with over 4000 people due to attend. The decision to cancel has been made by the producers (Neil Ecklersley of Speckulation Productions) and Adrian Jackson CEO and Artistic Director of Wolverhampton Grand said: "Wonderland has performed in over 25 venues up and down the country and it is extremely disappointing that Wolverhampton audiences will not now have the opportunity to see it. Cancelling a production is never taken lightly and only when all other options have been exhausted. 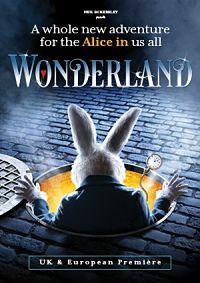 Unfortunately, in the case of Wonderland, it is understood that the production company had no other option. The Grand Theatre prides itself on the experience and customer service we deliver to our patrons and we deeply apologise for this situation which is completely outside the control of the theatre." Contact your point of sale to obtain a full ticket refund.